This is a neat idea (if not technically all that novel)… log in to Sun Learning Services portal, and you can play with a virtual instance of OpenSolaris for up to an hour. It does require Java, there are only 8 slots available at any one time, and right now they’re still provisioning OpenSolaris 2008.11 rather than the newer and shinier 2009.06. But if you want to give OpenSolaris a quick whirl, you might find it more convenient than downloading the LiveCD. More info in Brian Leonard’s blog entry. EDIT: I suppose I ought to add there’s some other cool stuff in 2.2.0 as well, particularly the ability to import/export appliances in OVF format. A couple of years ago, I bemoaned the inconsistency of our presentation of bookmarks and places. Last week I had cause to revisit the issue (for much the same reason as before—updating the OpenSolaris UI spec), hoping that things would have improved and I wouldn’t have to suggest too many tweaks to the OpenSolaris layout to keep things nice and consistent. Caveat: as in my original post, the latest release of Ubuntu (8.10, GNOME 2.24.1) was the closest I had to a community build when I was doing the comparison. So things may really be a little better or worse than they appear here, or may have been fixed in 2.25/2.26. The two Places menus on the panel (one in the menubar applet, one in the main menu applet) are now identical, at least in Ubuntu. This is good to see, although most users won’t see both at the same time anyway. The Go and Places menus in Nautilus (browser mode and spatial mode respectively) are pretty consistent with each other too. 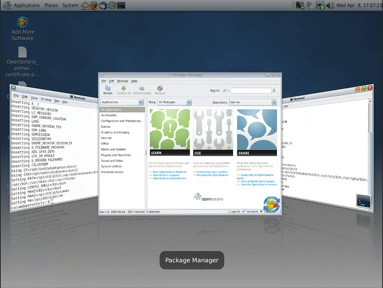 Inconsistent appearance/placement of mounted media, Computer, Desktop, Templates, File System, and CD/DVD Creator between sidebars and menus. Of course, it would be wrong to complain without offering any proposals, and I’ll get to that—just haven’t got time today. The current draft of the OpenSolaris 2009.04 UI spec does include my first quick attempt, but that’s currently based more on “least amount of work to fix” rather than “what might be most useful”… and we all know that’s not really the way to do it, right kids? Sun are officially launching OpenSolaris 2008.11 today… although as the name suggests, it was pretty much ready to go at the end of last month, and those in the know have been able to download it from both the community website and the distro website since then You can join us at 1700 UTC today for a web chat with some of the people involved. Glynn has written up a good summary of new features, which include GNOME 2.24, ZFS Time Slider, accessible install, and big improvements to plug’n’play printer support, automatic network configuration, and laptop suspend/resume. The number of additional packages available in the repositories has greatly improved since the 2008.05 release, and we now have various repos and a new process that will make contributing packages easier than ever. Roman Strobl has produced a 12 minute screencast to show off some of the new bits, and Erwann Chénedé has a shorter one that focuses exclusively on Time Slider, which seems to have been generating a lot of interest. Of course, 2008.11 still has all the usual Solaris goodness like ZFS, Zones and Dtrace built-in, with the Solaris Trusted Extensions now just a click away too, giving you access to one of the most secure desktops on the planet*. So why not give the LiveCD a spin? You can grab it via BitTorrent, or download the ISO directly from Sun (or alternatively, from the genunix mirror, or via FTP from LTH in Sweden). Slightly crummy name, but great to see the first phase of the ZFS Time Slider project that Erwann, Niall and Tim have been working on coming together in time for our OpenSolaris 2008.11 release next month. It works a bit like another company’s product of a similar name, except right now ours only takes regular snapshots to the same disk, rather than backing up to removable media (but we’ll probably end up doing that too). It’s not quite the auto-save function that Federico was talking about last week and at GUADEC, but it’s certainly nice to see some of the power of ZFS in use on the desktop at last. So, we’re attempting to follow this advice for a couple of OpenSolaris applications we’re working on. It works fine for the hicolor icons, but the advice for themes that want to over-ride them is rather vague: “You can also provide icons for other themes in here [$pkgdatadir/icons], by installing them into a subdirectory for that theme.”The question is, who’s responsible for installing them? The theme or the app? Seems to me there are problems either way. If the theme installs them, first it has to find out where that app installed its hicolor app-specific icons. It will usually be /usr/share/appname/icons/hicolor, but there’s no guarantee about the value of $pkgdatadir for any particular application. Once over that hurdle, the theme is now stomping in the application’s territory. At best, uninstalling the app will leave a $pkgdatatdir/icons directory on your disk, containing a bunch of icons that aren’t going to be used any more. At worst, the app uninstall might just lazily blow away the $pkgdatadir directory altogether, wantonly deleting files that were installed by another package (the theme). On the other hand, though, we surely can’t expect each app to be responsible for installing icons for every theme that wants to override them. Distros can of course patch those apps downstream with their branded icons du jour, but that will soon become cumbersome when there are more than two or three such apps. And independent theme artists, such as those who contribute to art.gnome.org, don’t have the luxury of patching any apps at all. So their themes would never be able to override app-specific icons.